Lloret de Mar is the Costa Brava party town, but even for walkers it has it's attractions. Aside from the main beach and neighbouring Platja de Fenals, there is also the quieter discrete (and naturist) beach of Platja de Boadella, and next door again the grander beach of Platja de Santa Cristina. However, last year we walked the GR92 coastal route from Blanes, past Lloret de Mar and on to Tossa de Mar we noted how the G92 seemed to miss out these beaches. So we return, to find out what options there are to link these areas. And as we discover though Boadella is reached easily and there are signs for the GR92 close to the beach, Santa Cristina has been entirely fenced in and there are no options other than to follow the road for the GR92. It is still possible to go in to the Santa Cristina area for the hermitage and the beach, but access is only through the access road (or via the hotel). All the way along the Boadella side is a long fence that reaches down to the cliffs above Santa Cristina beach. 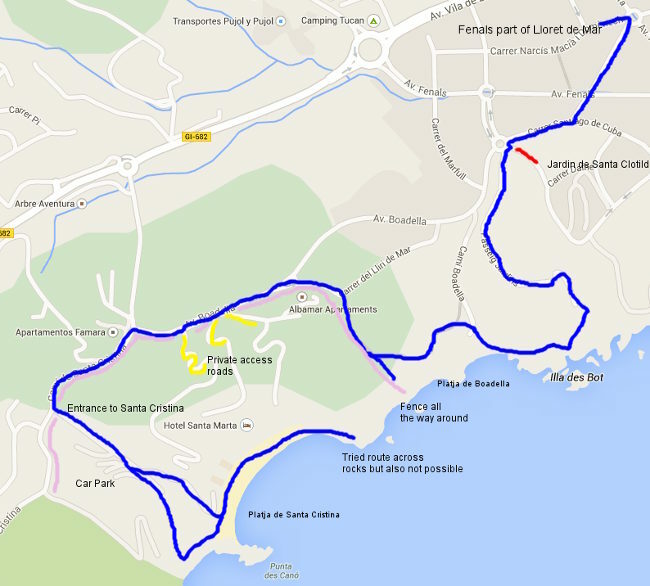 So while the two beaches (Santa Cristina includes one larger and one smaller beach Treumal) in the fenced in area are beautiful, the lack of a coast route access is very disappointing, made more so by the fact that the Santa Cristina area is run by the Lloret council. It is an area used for festivals and is very well maintained and the beaches themselves feel quite private and privileged, so maybe it's not all bad. 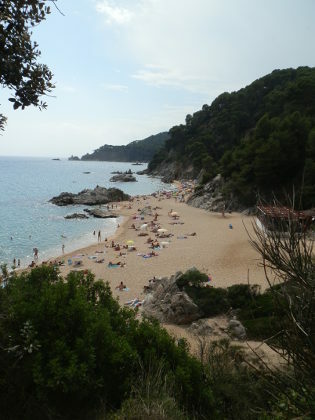 To reach the beaches we start just in among the new flats and apartment blocks of the Fenals area of Lloret de Mar. 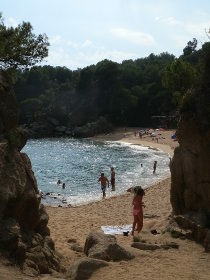 Most holidaymakers will go to Fenals beach - the quieter of the two main Lloret beaches. We're heading for Boadella and to get there you pass around the Jardins of Santa Clotilde and into the woods at the side. There are a number of tracks that then take you down to Boadella beach. This is definitively a nudist beach with plenty of naturists particularly among the rocky coves to the right and to the left of the main sand beach. Boadella has a chiringuito on the sand, but facilities are relatively simple compared to the more dynamic Lloret beaches. From Platja de Boadella we follow the marked tracks that point to Santa Cristina - these are marked as GR92 but on our walk from Blanes we didn't quite get as close to the beach. The tracks climb into the woods above the beach and we really want to try to keep to the coast, but in front of us we run into The Fence. This is a large and long fence covered with a matting that runs all the way from the cliff edge closest to the sea, up to the road. 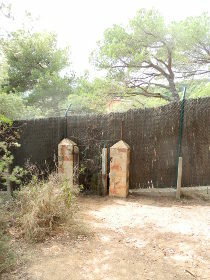 There is no way past or through the fence for walkers, and just the occasional tantalising glimpse of the beach and hermitage on the other side. So our GR92 route was right and there is no linking path other than by road. We follow the road around - there are a couple of access points into the Santa Cristina area but these are private. The first is just access to apartments, the second access for hotel guests only to take them down to the hotel on Santa Cristina beach. So we are stuck following the road around the outside to the main entrance where we can walk down through the car park (entry is free for walkers, or €6.50 a day for car parking). The gardens and hermitage, with its tiled dome, are beautiful and very well taken care of, with the restricted access making the whole area feel quite exclusive. The hermitage itself is a large decorated church built in the 18th Century built from money collected among the people of Lloret. Santa Cristina hermitage and gardens therefore hold a special place in the hearts of the local population and is the location for festivals and traditions. At the bottom of the gardens, we reach the beaches - there are two separated by a small rocky outcrop and along the paths there are copies of famous paintings made of the beaches and area. The smaller of the two beaches (Treumal) is separated from the larger main beach by a rocky headland with a sheltered corner tucked under the rocks. We walk along the beach which is quiet and reserved. The grounds of the hotel extend down to the edge of the sand and there is a largish bar and restaurant area. On the far side of the beach, there are rocks at the bottom of the cliffs and it is possible to scramble around. For the sake of discovery we tried to see if we could get all the way to Boadella over the rocks, but the way is blocked by a couple of impassable bays. It would probably be possible to swim across the final bays, but it's not a practical option for walkers. So the only option was to head out the way we came, effectively retracing our steps. The beaches and area of Santa Cristina is beautiful, but it remains a pity that it remains a diversion from the GR92.